Kisenosato Yutaka (born July 3, 1986, as Yutaka Hagiwara (萩原 寛, Hagiwara Yutaka)) is a retired sumo wrestler from Ibaraki, Japan. He made his professional debut in 2002, and reached the top makuuchi division in 2004 at the age of just 18. After many years in the junior san'yaku ranks, he reached the second highest rank of ōzeki in January 2012. He earned three kinboshi or gold star defeats of yokozuna in his career leading up to ōzeki and nine special prizes. He scored more than 20 double-digit winning records at the ōzeki rank. In 2016, he secured the most wins in the calendar year, the first wrestler to do so without winning a tournament in that year. * Up to date as of Jan 16, 2019. After being a runner-up in a tournament on twelve occasions, he broke through at the January 2017 tournament, winning his first top division championship or yūshō with a 14–1 record and subsequently was promoted to yokozuna, the first Japanese born wrestler to reach sumo's highest rank since Wakanohana in 1998. He had been a candidate four times previously (July 2013, January 2014, July 2016 and September 2016), but in each case he failed to achieve the necessary number of wins. Kisenosato won his first tournament as a yokozuna in March 2017, but suffered a left chest muscle injury in the process and was not able to complete another tournament until September 2018. His eight straight missed tournaments was a record for a yokozuna. In January 2019, he announced his retirement from sumo. He is now an elder of the Japan Sumo Association under the name of Araiso. He was born in Ashiya, Hyōgo, but moved to Ryūgasaki, Ibaraki when he was two years old. In his second year of middle school he moved to neighbouring Ushiku but continued to attend school in Ryūgasaki. Though Hagiwara was a fan of watching sumo from a young age, he was on his schools' baseball teams as a pitcher in primary and junior high school. He eventually gave up when he realized he was only excelling because of his size. On a chance meeting with then head of Naruto stable, the former yokozuna Takanosato, the head of the stable convinced Hagiwara's initially skeptical parents that he was a great candidate for sumo. Hagiwara eventually joined the stable upon finishing junior high school. The stable was known for its strict environment and Naruto Oyakata would encourage him to always use forward-moving techniques in training to better prepare him for tournament situations, rather than go for a quick win by stepping backwards. He fought his first bout in March 2002 under his own surname of Hagiwara. He rose quickly through the divisions, entering the second jūryō division in May 2004, aged 17 years and 9 months, the second youngest ever jūryō wrestler after Takanohana, whom Kisenosato had idolised when he was a boy. Three tournaments later, in November 2004, he entered the top makuuchi division, again the second youngest (18 years 3 months) after Takanohana. To mark his entry into the top division his stablemaster gave him the shikona or sumo name of Kisenosato. His first major top division result was 12 wins against three losses in the September 2005 tournament, where he was awarded the Fighting Spirit prize. He was promoted to the rank of komusubi in July 2006, which he held until March 2007 when he fell back to maegashira 1. Early in his top division career Kisenosato was involved in some controversial bouts with yokozuna Asashōryū. He defeated him for the first time in September 2006, and was awarded the Outstanding Performance Prize. Shaken by this, Asashōryū responded in the next tournament by leaping to the side at the tachi-ai and employing a highly unusual leg kicking technique called ketaguri. Afterwards Asashōryū was criticised by the Yokozuna Deliberation Committee for using this rare move. In March 2007 Kisenosato slapped Asashōryū around the face during their match. Asashōryū was so riled by this that he gave Kisenosato a small kick in the back after the bout was over, which prompted much criticism from the Japanese media. In July 2007 he turned in a strong 11–4 record and derailed Kotomitsuki's hopes of a tournament championship on the final day by slapping him down. This earned him promotion back to komusubi for September 2007. Kisenosato defeated Asashōryū once again in the yokozuna's comeback tournament in January 2008, earning him his first kinboshi or gold star, (his first win over Asashōryū had been at komusubi rank so he was ineligible then) and his second Outstanding Performance Prize. Returning to komusubi in the March 2008 tournament, he lost to Asashōryū on the opening day but defeated three out of four ōzeki and held his rank with an 8–7 score. In May 2008 he scored another win over Asashōryū on opening day, finishing with a strong 10–5 record and a share of the Fighting Spirit prize. Despite this he failed to be promoted to sekiwake, only the third time since 15-day tournaments were introduced in 1949 that a komusubi with ten wins has not moved up the rankings. Kisenosato spent nine tournaments at komusubi without making sekiwake, which has only happened to three previous wrestlers, Dewanishiki, Fujinishiki and Takamiyama. Back in the maegashira ranks for the September 2008 tournament, he was the only man to defeat tournament winner Hakuhō, earning him his second kinboshi, but he fell short with six wins against nine losses. In November 2008 he scored 11–4, sending him to komusubi for the fifth time in the January 2009 tournament. He scored eight wins there, and Aminishiki's losing record meant Kisenosato finally made his long-awaited sekiwake debut in March 2009, in his tenth tournament at a san'yaku rank. He produced a somewhat disappointing 5–10 record and was demoted to maegashira 4 in May. However, he proved this rank was too low for him by producing a 13–2 record, his best ever top division score, and won his third Fighting Spirit prize. This performance returned him immediately to sekiwake for the July 2009 tournament. He came though with a good 9–6 score there, defeating Asashōryū (for the fourth time) and three ōzeki. In September he failed on the final day to get kachi-koshi but remained in the san'yaku ranks at komusubi for the November 2009 tournament. However, a 6–9 in Kyushu saw him drop back to the maegashira ranks. In January 2010 he won his first five matches, before losing five in a row. He finished on 9–6 and returned to komusubi for the March tournament. He remained in san'yaku for the next three tournaments but fell back to maegashira 1 in November 2010. On the second day of the Kyushu tournament he upset Hakuhō, bringing to an end the yokozuna's post-war record of 63 consecutive victories. He was rewarded with the Outstanding Performance prize and promotion back to sekiwake. He defeated Hakuhō once again in the following tournament, scoring 10–5 and winning another Outstanding Performance award, his fourth. Japan Sumo Association official Takanohana said after the tournament that Kisenosato would be considered for promotion to ōzeki if he won at least 13 bouts in the March 2011 basho, which would give him 33 wins over three tournaments (the usual minimum requirement for ōzeki). However, that tournament never took place due to a match-fixing scandal and in the subsequent 'technical examination' tournament in May he secured a majority of wins only on the final day. After a solid 10–5 score in July, in the September 2011 tournament Kisenosato raced to an 8–0 start, before losing three in a row. However, he then rebounded by beating Hakuhō for the third time in their last five meetings on Day 12. He finished runner-up alongside Kotoshōgiku on 12–3, his first ever runner-up performance, and also shared the Outstanding Performance prize. With 22 wins in the last two tournaments, he was once again a candidate for promotion to ōzeki in November. However, with a record of 10–4 going into his match on the final day, he lost to Kotoshōgiku. This gave him a record of "only" 32 wins in three tournaments, below the Association's loosely defined ōzeki promotion standard of 33, but the Sumo Association had already indicated before the match took place that he had done enough to earn promotion. This was the second successive tournament to feature an ōzeki promotion, following Kotoshōgiku. Kisenosato credited his success to his late stablemaster, the former yokozuna Takanosato, who had died suddenly shortly before the tournament. "Everything that he taught me about sumo led to this result and I'm so grateful." He had long been regarded as one of the most promising Japanese sumo wrestlers, but prior to reaching ōzeki there had been concern expressed about his seeming inability to hold down a san'yaku position and a possible lack of fighting spirit. His stablemaster had also criticized him in 2010 for his attitude in training. Kisenosato's promotion was made official on 30 November, following a unanimous vote by the Sumo Association's executive board. Chairman Hanaregoma commented, "He has been solid through the last several tournaments. I want him to start putting himself in title contention." Kisenosato produced an 11–4 record in his debut ōzeki tournament in January 2012. In the May 2012 tournament he was leading the yūshō race after twelve days, the first Japanese born wrestler to do so at that stage since Tochiazuma in 2007, but then defeat to Hakuhō on Day 13 meant he was caught by rank–and–filers Kyokutenhō and Tochiōzan, and a final day loss to Baruto meant he finished on 11–4 and missed out on a playoff for the championship. In the next five tournaments he produced five double figure scores, but only just, as they were all 10–5. However, in the May 2013 tournament he won his first thirteen matches, making a strong case for a possible start at a run for yokozuna promotion, but he was defeated by Hakuhō on Day 14, and he also lost his final day bout to Kotoshōgiku to finish two wins behind Hakuhō on 13–2. In July 2013 he stopped Hakuhō's streak of 43 consecutive victories by beating him on the 14th day – the third time he has ended a significant winning run of the yokozuna, having also defeated Hakuhō after his 63 wins in a row in November 2010 and 23 in January 2011. After the November 2013 tournament, in which he was runner-up for the fourth time in a row, he was told by the Sumo Association that he would be promoted if he won the championship with at least 13 wins, but he collapsed in the following January basho and won only seven bouts. He pulled out on the final day, missing the first bout of his career. He maintained his ōzeki status with a 9–6 result in March 2014 and was never in danger of demotion again. He finished runner-up in May 2014, January 2015 and May 2015. In the second half of 2015 Kisenosato maintained his consistent form: he went 10–5 in July (including a win over Kakuryū), 11–4 in September and 10–5 in November (beating Harumafuji on the final day). After a moderate 9–6 in January 2016 he was back to his best in March, recording 13 wins and finishing runner-up to Hakuhō. He was runner-up for the tenth time in his career in the May 2016 tournament, finishing on 13–2 and having been at 12–0 before losing to Hakuhō and Kakuryū on consecutive days. Kisenosato went into the July 2016 tournament with the possibility of being promoted to yokozuna if he could win the tournament, however he was unable to clinch a victory and was runner-up for the eleventh time, and the third time in a row. He was criticized by Hideshige Moriya, chair of the Yokozuna Deliberation Council, for the manner of his defeat to the eventual winner Harumafuji on Day 13, which saw him fall to 10–3: "The way he lost to Harumafuji makes him unworthy of recommendation (for promotion)." He finished this tournament with a 12–3 record. His fourth bid for yokozuna promotion in September ended in failure after two losses in the first three days, to Okinoumi on the opening day and Tochinoshin on Day 3, and a final score of 10–5. In the November 2016 tournament Kisenosato was runner up for the twelfth time in his career finishing with a 12–3 record including victories over all three yokozuna (dealing yokozuna Kakuryū, the victor of the tournament, his only loss). He also won against ōzeki Gōeidō, and ōzeki Terunofuji. His three losses were against Endō, Shōdai, and Tochinoshin. Kisenosato finished out 2016 with the most victories in a calendar year getting 69 wins. Harumafuji had 67 wins, and Hakuho (who sat out one tournament) had 62 wins. He is the first wrestler in the modern era of sumo do to this without winning a tournament. In 2016 Kisenosato was runner up four times, and under yokozuna promotion twice. Kisenosato started off the January 2017 tournament very strong, winning his first 8 days straight, however on day 9 Kisenosato lost to fellow ōzeki Kotoshōgiku. This didn't put him off leading the tournament since Hakuhō also lost on day 9. Kisenosato won the remaining days of the tournament. On Day 14, Kisenosato secured his much-anticipated first career top-division championship with a win over Ichinojō and a Hakuhō loss against Takanoiwa. His first championship came in his 31st tournament as an ōzeki, longer than any other ōzeki since the Shōwa era began in 1926. He defeated yokozuna Hakuhō on Day 15 to conclude the tournament with a 14–1 record. Having won his first tournament in January 2017, combined with his overall 2016 record (including four runner-up finishes), Kisenosato was considered for promotion to the yokozuna rank. The Japan Sumo Association's Yokozuna Deliberation Council met on January 23, 2017, and determined that Kisenosato was a suitable candidate. The Board of Directors accepted the Council's recommendation two days later. Shortly after the Board of Directors met on January 25, 2017, two envoys conveyed the decision to Kisenosato and his stablemaster. Kisenosato accepted, formally becoming the 72nd yokozuna. He is the first wrestler of Japanese descent to be promoted to yokozuna since Wakanohana in 1998. As is the tradition for a new yokozuna, he performed his first yokozuna dohyō-iri, or ring entrance ceremony, on January 27 at Meiji Shrine in Tokyo. 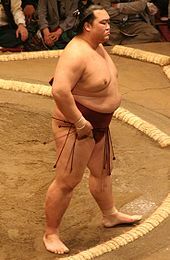 He chose to use the Unryū style of ring entrance ceremony after studying footage of previous yokozuna and practicing until late the previous night to master the technique. His stablemate Takayasu acted as sword carrier while Shōhōzan took the role of dew sweeper. He was listed on the west side of the new banzuke released on February 27, the first Japanese born wrestler to appear as a yokozuna on the ranking sheets since Takanohana retired in January 2003. He told a press conference, "My mission is to always be involved in the championship title race. That is an absolute must." At Osaka in March he began impressively, winning his first twelve matches to lead the tournament but was defeated by Harumafuji on day 13 sustaining shoulder and chest injuries as he fell from the dohyō. Despite leaving the arena with his arm in a sling, his stablemaster said Kisenosato was not immediately withdrawing from the tournament and would fight on Day 14. However he lost easily to Kakuryū. On the final day of the tournament, Kisenosato defeated Terunofuji to tie him with a record of 13–2 and force a playoff. In spite of his injured shoulder, Kisenosato won the playoff match beating Terunofuji again to win the tournament, his second in a row. This victory made him the first newly promoted yokozuna in 22 years to have won his debut tournament. His medical certificate was published by the Japan Sumo Association after the tournament, indicating injuries to his left chest muscle and left upper arm, with a month-long recovery period. He skipped the regional tour in April to allow his injuries to heal. He was ranked as the top East Yokozuna on the May banzuke, the first time a Japanese wrestler has held the highest position since Takanohana in July 2001. He withdrew from the tournament on Day 11 having lost four matches, due to his failure to recover from his upper body injuries and inability to use his left arm properly. Nishiiwa Oyakata, a coach at Tagonoura stable, said that Kisenosato had suffered from a lack of preparation time. "He only had about a week to practice against wrestlers before the meet. You would usually train for about a month after healing from injury, so I wish he had more time. I hope he will be able to live up to fans’ expectations at the Nagoya basho." The only previous time Kisenosato has withdrawn from a tournament in his 15-year career was the final day of the January 2014 tournament. Kisenosato declared himself fit for the July tournament but lost to Mitakeumi on the opening day and Tochinoshin on Day 3. He then withdrew from the tournament on Day 6 after suffering a left ankle ligament injury in his defeat the previous day to Ikioi. His stablemaster said, "The pain in his left arm seems to be gone but he hasn't been able to put on good sumo." He began full training for the Aki basho with 13 practice bouts with Yago of the jūryō division on September 4, but admitted he "had a long way to go." Shibatayama Oyakata commented, "He is not in a condition to engage in bouts at a sumo tournament. I felt that he was just testing how much he has recovered from his injuries." On September 7 Kisenosato's stablemaster confirmed that he would sit out the tournament, saying "it takes courage to rest, and I hope this break will turn things in the right direction." He returned for the November 2017 tournament in Kyushu but pulled out on Day 10, having already given away five kinboshi to maegashira ranked wrestlers, tying the record for the most conceded in one tournament since 15 day honbasho were established in 1949. Kisenosato's stablemaster said he was suffering from a contusion in his lower back and a left leg ligament injury. He entered the January 2018 tournament but withdrew on Day 6 with a 1–4 record having suffered three successive defeats to maegashira. His stablemaster indicated that Kisenosato had injured the left pectoralis major muscle of his chest, near his old injury. This marked the fifth successive tournament that he had either failed to enter or dropped out of. Having received criticism for repeatedly returning to action without healing properly, Kisenosato said that the outcome of the next tournament in which he competes will determine whether or not he continues his career. He did not enter the March 2018 tournament, and his decision not to participate in May meant a failure to complete seven straight tournaments, equalling the longest absence for a yokozuna since the six tournaments a year system began in 1958. On July 2 Kisenosato faced Hakuhō in a training session held at Kokonoe stable, the first time the two yokozuna had met in the practice ring in over a year, but he ultimately decided not to enter the Nagoya basho. Missing his eighth straight tournament in July, Kisenosato said, "Although I have been trying desperately to be in shape, I decided to withdraw since I haven't made enough progress. I will put everything into competing at the next meet." Kisenosato fully participated in the Yokozuna Deliberation Council's soken or training session shortly before the September 2018 tournament. He said, "I'm fully prepared. I did everything there is to be done," and his stablemaster said Kisenosato was in the best condition since his injury. He finished the tournament with a 10–5 record, the first time he has completed a tournament since March 2017. He met Hakuhō on the 13th day for the 60th time, but the first time as a yokozuna. Hakuhō defeated Kisenosato but said after the tournament, "I think he did a fine job. He is someone who will propel the sport to greater prosperity." He was the sole yokozuna to enter the November 2018 tournament, but lost his opening three bouts, and seemed to observers to be still suffering from a lack of power in his left upper body. He became the first yokozuna to lose his first three matches since Asahifuji in January 1992. On Day 4 he was defeated by Tochiōzan, the first yokozuna since Miyagiyama in 1931 to lose his first four bouts. He withdrew from the tournament the following day, citing an injury to his right knee suffered on the opening day (unrelated to his previous injury problems). After the tournament he received an "encouragement" from the Yokozuna Deliberation Council, which indicates that his performance is considered to be below that of yokozuna standard. The Council had not previously issued any sort of resolution on the previous occasions in which Kisenosato had withdrawn or abstained from participating in a tournament. Kisenosato pulled out of the winter regional tour, but on December 25 he told reporters he intended to compete in the January 2019 tournament. Kisenosato was listed as the top yokozuna on the January 2019 banzuke, despite not winning a match in November, because the other two yokozuna had sat out completely. He lost his opening three bouts of the tournament, giving him a sequence of eight straight losses from the last day of the September 2018 tournament (not counting defaults), the worst by a yokozuna since 15-day tournaments were established in 1949. On the morning of the fourth day of the tournament, stablemaster Tagonoura announced that Kisenosato had decided to retire from the sport. His stablemaster said, "It was his decision. He told me he could no longer perform at the level he wanted to." In a press conference on January 16, 2019, Kisenosato said "I'm retiring as a wrestler in the ongoing tournament and assuming the name of Araiso as a sumo elder." He further went on to say, “Even though it’s very regrettable that I wasn’t able to live up to everyone’s expectations as a yokozuna, I don’t regret one bit of my career on the dohyo.” When mentioning the injury he suffered in March 2017, he said, “Since the injury, I was confident that I was doing the best I could. I wrestled with everything I had in the world, but I felt for the first time that I was unable to go on.” Further saying, "I was gradually recovering, but I was unable to wrestle in my own style. My condition couldn't return to that before I was injured." Kisenosato also expressed his gratitude to his supporters saying, "I was supported by so many people... I have nothing but gratitude." His stablemaster Tagonoura said of the retirement, "I was delighted when he became yokozuna but when you see him closely, you can tell that he was struggling a lot. These two years went like a flash." Hakuho on learning of Kisenosato's retirement said, "It’s lonely now. I’ve run out of words to express my appreciation for his efforts." Chief Cabinet Secretary Yoshihide Suga said during his daily briefing that, "I would like to give honor to what he has achieved and to send hearty cheers to Kisenosato." He will remain in sumo as a coach for Tagonoura stable under the name Araiso Oyakata for the mandatory one year before planning on opening his own stable. He is currently looking for a premises in the area between Akihabara Station and Asakusabashi Station. His official retirement ceremony (danpatsu-shiki) is due to be held on September 29, 2019. Kisenosato was mainly a yotsu-sumo wrestler, and his favourite grip on his opponent's mawashi was hidari-yotsu, or right hand outside, left hand inside. His most common winning kimarite was yorikiri (force out), followed by oshidashi (push out) and tsukiotoshi (thrust over). He was criticized for frequently stalling at the tachi-ai, or initial charge, in an attempt to unsettle his opponent. Kisenosato's injury in March 2017 prevented him from using his favoured defensive technique of ottsuke, where he traps his opponent's arm with his left. He had been encouraged by his first stablemaster, Naruto Oyakata, to base his style around his powerful left arm, and after the injury commentators noted that it appeared difficult for him to adapt and use his right in tournament bouts. Kisenosato confirmed this in an interview after his retirement, saying ""My left chest muscle became weak after that injury, and my opponents were able to easily escape my attempts for a hold. My physician proposed an idea to tape up the affected area, but I didn't want people seeing me like that. The injury limited my range of motion and I wasn't able to do the things I'd easily done before." ^ "Kisenosato Yutaka". sumo.or.jp. Nihon Sumo Kyokai. Retrieved 26 January 2017. ^ a b c "Sumo: Kisenosato secures ozeki promotion but loses on final day in Kyushu". Mainichi Daily News. 27 November 2011. Archived from the original on 27 November 2011. ^ Buckton, Mark (26 May 2016). "Consistent Kisenosato needs title to secure promotion to yokozuna". Japan Times. Retrieved 26 May 2016. ^ Nagatsuka, Kaz (2017-01-25). "Kisenosato becomes first Japanese-born yokozuna in almost two decades". The Japan Times Online. ISSN 0447-5763. Retrieved 2017-01-26. ^ a b "SUMO/ Kisenosato ends barren spell for Japan-born yokozuna". Asahi Shimbun. 25 January 2017. Retrieved 27 February 2017. ^ "Yokozuna Kisenosato to retire from sumo". NHK World. 16 January 2019. Retrieved 16 January 2019. ^ a b "Sumo grand champion Kisenosato to retire: stablemaster". Kyodo News. 16 January 2019. Retrieved 16 January 2019. ^ Kishmore, Divya (25 January 2017). "Japan gets its first home-grown sumo wrestler in almost two decades". International Business Times. Retrieved 25 January 2017. ^ a b "Late stablemaster Naruto 'believed in Kisenosato'". Japan News/Yomiuri Shimbun. 23 January 2017. Archived from the original on 2 February 2017. Retrieved 25 January 2017. ^ "Featured Rikishi: Kisenosato". sumoforum.net. December 2006. Retrieved 2008-02-10. ^ a b c "Kisenosato Yutaka Rikishi Information". Sumo Reference. Retrieved 25 January 2017. ^ a b Lamont, Tom (1 March 2008). "The annotated arena". The Guardian. Retrieved 29 December 2016. ^ "Kisenosato results by basho – Haru 2008". Sumo Reference. Retrieved 25 January 2017. ^ "2008 July Grand Sumo Banzuke Topics". Japan Sumo Association. 2008-06-30. Archived from the original on 2012-04-25. Retrieved 2008-06-30. ^ "Kisenosato results by basho – Aki 2008". Sumo Reference. Retrieved 25 January 2017. ^ "Hakuho's win streak over at 63". Asahi Shimbun. 16 November 2010. Retrieved 15 November 2010. ^ "Sekiwake duo have shot at ozeki". Japan Times. 25 January 2011. Retrieved 31 January 2011. ^ "Kisenosato results by basho – Natsu 2011". Sumo Reference. Retrieved 25 January 2017. ^ "Kisenosato credits late stablemaster". Daily Yomiuri Online. 29 November 2011. Retrieved 30 November 2011. ^ Buckton, Mark (2008-05-08). "How firm is the reign of the Mongolians?". Japan Times. Retrieved 2008-05-12. ^ Howard, Lon (April 2009). "Haru basho summary" (PDF). Sumo Fan Magazine. Retrieved 30 April 2009. ^ "Long road for first Japanese yokozuna in nearly 2 decades". Nikkei Asian Review. 25 January 2017. Retrieved 25 January 2017. ^ a b "Sumo: Kisenosato promoted to ozeki". Mainichi Daily News. 30 November 2011. Archived from the original on 30 November 2011. ^ "Kyokutenho beats Tochiozan for title". Japan Times. 21 May 2012. Retrieved 22 May 2012. ^ a b "Hakuho captures title as Kisenosato loses way". Japan Times. 27 May 2013. Retrieved 3 June 2013. ^ Schreiber, Mark (4 June 2016). "The struggles of a local sumo hero". Japan Times. Retrieved 8 June 2016. ^ "Kisenosato primed for yokozuna promotion bid". Japan Times. 25 November 2013. Retrieved 14 August 2015. ^ "Sumo: Yokozuna Harumafuji seizes sole lead in Nagoya". Kyodo News. 22 July 2016. Retrieved 6 October 2016. ^ "Sumo: Promotion-chasing Kisenosato falls to shock defeat on first day". News On Japan. 12 September 2016. Retrieved 25 January 2017. ^ a b "New Yokozuna Kisenosato vows to get stronger". The Mainichi. 25 January 2017. Retrieved 25 January 2017. ^ "Ozeki Kisenosato clinches first title". The Japan Times. 21 January 2017. Retrieved 21 January 2017. ^ Miki, Shuji (2 February 2017). "SUMO ABC (44) / Kisenosato's defense helps him escape trouble, beat Hakuho". Retrieved 13 February 2017. ^ "Kisenosato boosts case for promotion to yokozuna". www.japantimes.co.jp. Kyodo News. 22 January 2017. Retrieved 23 January 2017. ^ "Kisenosato becomes Yokozuna". www3.nhk.or.jp. NHK World. 25 January 2017. Archived from the original on 25 January 2017. Retrieved 25 January 2017. ^ "SUMO/ Kisenosato to end long drought of Japan-born yokozuna". Asahi Shimbun. 23 January 2017. Retrieved 23 January 2017. ^ Nagatsuka, Kaz (25 January 2017). "Kisenosato becomes first Japanese-born yokozuna in almost two decades". The Japan Times. Retrieved 25 January 2017. ^ "Yokozuna Kisenosato carries out first ring-entry ceremony". Japan Times Online. 27 January 2017. ^ a b "Kisenosato in west slot for debut at yokozuna". Japan Times. 27 February 2017. Retrieved 27 February 2017. ^ "Kisenosato hurt while taking 1st loss". Yomiuri Shimbun. 24 March 2017. ^ "Sumo: Yokozuna Kisenosato to fight in Spring tourney despite injury". The Mainichi. 25 March 2017. Archived from the original on 2017-03-26. Retrieved 25 March 2017. ^ "Sumo: Injured Kisenosato suffers 2nd loss, Terunofuji takes lead". The Mainichi. 25 March 2017. Archived from the original on 26 March 2017. Retrieved 25 March 2017. ^ "Kisenosato wins Spring sumo title in debut as grand champion". stltoday.com. Retrieved 2017-03-26. ^ "Sumo: Kisenosato additionally diagnosed with chest muscle damage". The Mainichi. 4 April 2017. Archived from the original on 5 April 2017. Retrieved 4 April 2017. ^ "Kisenosato facing month of treatment on injury". Japan Times. 29 March 2017. Retrieved 6 April 2017. ^ Gunning, John (26 April 2017). "Emergence of new generation bodes well for Summer Basho". Japan Times. Retrieved 5 May 2017. ^ "Kisenosato heads into Summer Basho as top-ranked fighter". Japan Times. 1 May 2017. Retrieved 4 May 2017. ^ a b c "Injury forces Kisenosato out of Summer Basho". Japan Times. 24 May 2017. Retrieved 24 May 2017. ^ a b "Sumo: Injured Kisenosato, Terunofuji withdraw from Nagoya basho". The Mainichi. 14 July 2017. Archived from the original on 2017-07-17. Retrieved 14 July 2017. ^ "Kisenosato resumes practice but still in doubt for Autumn Basho". Japan Times. 4 September 2017. Retrieved 5 September 2017. ^ "Yokozuna Kisenosato, Kakuryu pull out of Autumn Basho". Japan Times. 7 September 2017. Retrieved 7 September 2017. ^ a b "SUMO/ Yokozuna Kisenosato to skip remainder of Kyushu basho". Asahi Shimbun. 21 November 2017. Retrieved 21 November 2017. ^ a b c "SUMO/ Kisenosato pulls out of Tokyo basho, has back to wall". Asahi Shimbun. 19 January 2018. Retrieved 19 January 2018. ^ a b "Kisenosato says he's determined to regain form". Japan Times. 3 February 2018. Retrieved 5 February 2018. ^ "Injured Hakuho withdraws from Spring Grand Sumo Tournament". Reuters. 9 March 2018. Retrieved 9 March 2018. ^ "Sumo: Grand champion Kisenosato to miss 7th straight meet". The Mainichi. 11 May 2018. Archived from the original on 11 May 2018. ^ Suzuki, Kensuke (4 July 2018). "Kisenosato at a crossroads: Reclaimed glory or disgrace". Asahi Shimbun. Retrieved 30 July 2018. ^ "Sumo: Grand champion Kisenosato to miss record 8th straight meet". The Mainichi. 5 July 2018. Archived from the original on 11 July 2018. Retrieved 10 July 2018. ^ Gunning, John (5 September 2018). "Sumo's Yokozuna Deliberation Council plays important role in overseeing sport". Japan Times. Retrieved 5 September 2018. ^ "Sumo: Kisenosato ready to make injury comeback at autumn tourney". Kyodo News. 6 September 2018. Retrieved 6 September 2018. ^ "Hakuho pleased after latest triumph". Japan Times. 24 September 2018. Retrieved 24 September 2018. ^ "Sumo: Kisenosato suffers third straight loss in Kyushu". The Mainichi. 13 November 2018. Retrieved 13 November 2018. ^ "Sumo: Kisenosato falls to 4th straight loss at Kyushu meet". The Mainichi. 14 November 2018. Retrieved 14 November 2018. ^ "Sumo: Injury-plagued Kisenosato pulls out of Kyushu meet". The Mainichi. 15 November 2018. Retrieved 15 November 2018. ^ "SUMO/ Kisenosato pulls out of Kyushu tourney after record 0–4 start". Asahi Shimbun. 15 November 2018. Retrieved 15 November 2018. ^ "Takakeisho reflects after first career championship". Japan Times. 26 November 2018. ^ "JSA council's 'encouragement' of Kisenosato more a rebuke". Asahi Shimbun. 27 November 2018. Retrieved 28 December 2018. ^ "Injured yokozuna Kisenosato to miss start of upcoming regional tour". Japan Times. 28 November 2018. Retrieved 30 November 2018. ^ "Kisenosato plans to compete in New Year Basho". Japan Times. 25 December 2018. Retrieved 28 December 2018. ^ "Sumo: New Year rankings raise more questions than answers". The Mainichi. 25 December 2018. Archived from the original on 15 January 2019. ^ "Sumo: Kisenosato suffers 3rd straight loss in fateful New Year meet". The Mainichi. 15 January 2019. Archived from the original on 15 January 2019. ^ "Sumo grand champion Kisenosato retires after 3 straight losses". ESPN. 15 January 2019. ^ "Yokozuna Kisenosato retiring after 3-straight losses in New Year tournament". Mainichi. 16 January 2019. ^ "Yokozuna Kisenosato retires, citing injury struggles, leaving no Japanese at top sumo rank". Japan Times. 16 January 2019. ^ "Kisenosato, Japan's last remaining sumo champion, retires". BBC. 16 January 2019. ^ "Injury-plagued grand champion Kisenosato retires". Reuters. 15 January 2019. ^ "Kisenosato retirement, next year akihabara rebirth, Araiso stable creation plan". Hochi. 17 January 2019. ^ "元稀勢の里引退相撲チラシ完成！ラオウのイラストも" (in Japanese). Nikkan Sports. 13 March 2019. Retrieved 14 March 2019. ^ Slack, Jack (29 January 2016). "Kotoshogiku: The Japanese Ozeki Who Could". Fightland. Retrieved 2 February 2016. ^ "SUMO/ Persistence leads Kisenosato to the top—and then to early retirement". Asahi Shimbun. 16 January 2019. Retrieved 16 January 2019. ^ "Sumo: Ex-yokozuna Kisenosato opens up about injuries, anxieties, future". The Mainichi. February 9, 2019. Retrieved 14 March 2019.